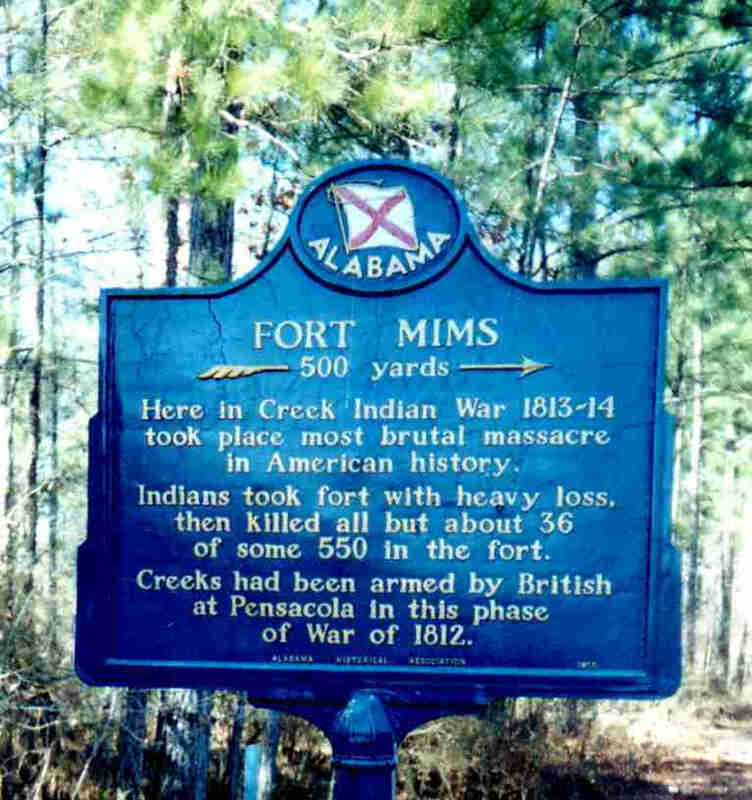 After we had been in the Fort six months, the Indians became very hostile, crossed the Alabama and burned houses, corn, destroyed cattle, and killed people that were at home in spite of all that could be done by the scouts. Every family was obliged to go into a Fort. There was an old widow named Cobb, who had two sons old enough to be in the service, but she told them to stay at home and make corn, she was not afraid of Indians, but one day while the boys were plowing in the field, they saw Indians jumping over the fence, the boys stripped the gear off the horses, mounted in a moment, and flew to the house, calling their Mother. 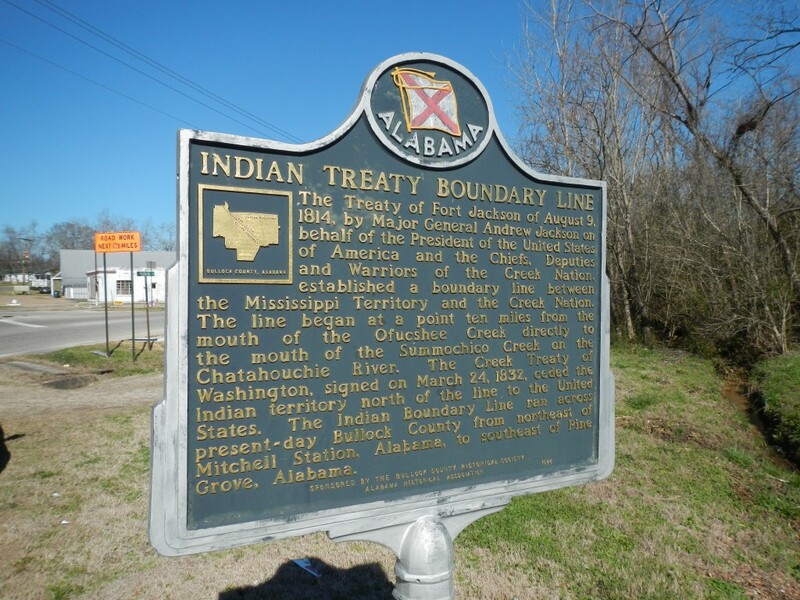 She ran out to meet them, and just as she passed her chimney corner, she saw her dye tub with indigo blue, she just turned the whole contents into her lap, jumped up behind her son and galloped to our Fort from Choctaw Bluff, eight miles. When they arrive, they were all blue, from head to foot. That was the only thing they saved was the thread that was in the blue dye. The women in the Fort all joined and soon made a piece of cloth of the blue, for all had spinning wheels and looms in the Fort, for it was the only way that clothes were obtained in those days. 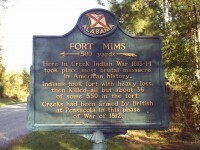 The day Fort Mims fell was a sad day to all the country. Every heart nearby became paralyzed with fear, and our men that had been so brave, became panic striken, and their families pleading to be taken to Fort St. Stephens. Father and dear old, Captain Foster spoke to them in vain, they stampeded, some families took to the canebrakes, some to St. Stephens, some down the river to Fort Stoddard where the arsenal is now. 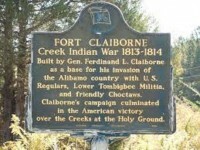 Just as Father and Mother, with Sister and myself were in the act of getting into the canoe to cross the Bigbee, for not a soul was left in the Fort, a young man came running down the bluff calling to Father not to leave him, for God’s sake, to be murdered, for the Indians were coming. “Oh, don’t leave me, I shall die if you do.” Mother was standing on the bank until we were safely seated, for the canoe was a small one, could only carry four persons. Father told the man that it was impossible for him to take him in that his family must be saved first. 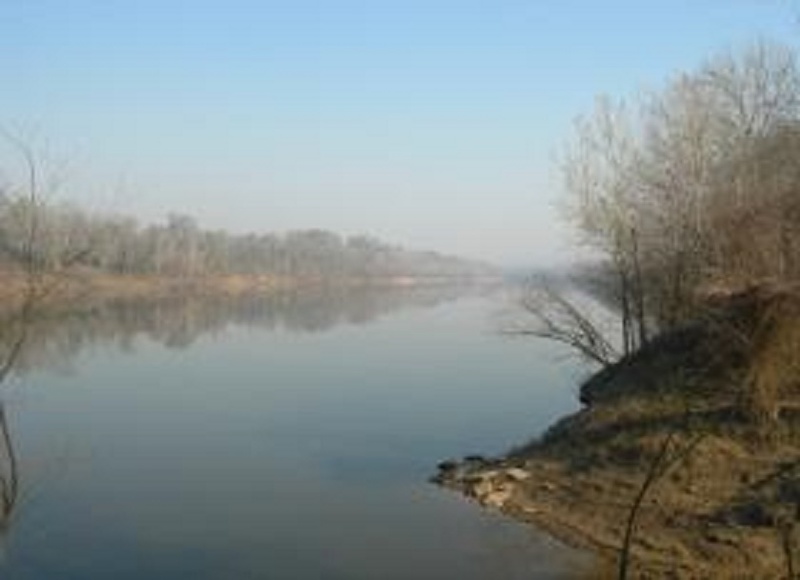 The poor fellow cried out, “Oh, God, I shall be killed.” Mother said, “Oh, dear husband, take the coward in, I will wait here until you come after me,” and she actually pushed him in, and with her foot sent the canoe flying off, and sat down on the sand quietly waiting Father’s return. 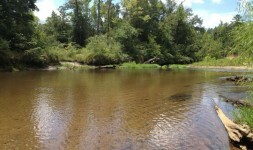 As soon as the boat struck shore, the fellow made tracks for the Choctaw Nation. In a few days, after the excitement, all the people returned and pledged themselves to remain and hold the Fort. In the meantime, the young folks were courting and making love, although they were in a Fort expecting to lose their scalps at any moment. Mr. George S. Gullet became engaged to my sister, Mary Eades, and then implored our parents to allow the marriage, because he could be of so much help to us, could take care of Sister, and then Father would only have Mother and me to take care of, so they consented that the marriage should take place in the Fort. But she set to work with a will. Invitations were general to the whole inhabitants of the Fort, they were married, and a jolly wedding it was. One old man sat down to the long table, looked over at Mother, and she said, “Help your self, sir.” I thank you, Madam, I will with presumption.” I laughed, and being a little girl, was sent off from the table. Not long after the wedding we had a respite, the Indians were driven back, and all returned joyfully to their houses. 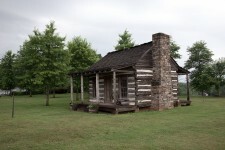 Very few had been destroyed this side of Choctaw Bluff, but we could hear of fearful murders. 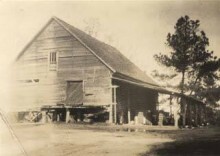 Men would venture too far, and again and again we were forced to return to the Fort until at last General Jackson came to our rescue and finished the war. All the gallant young men joined his army. 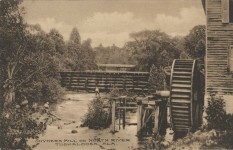 My Father carried his provisions up the Alabama in his barge, even as high as Fort Jackson above Wetumpka. 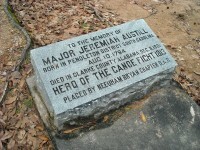 Sam Dale, Jere Austill, and many others were with Jackson fighting like heroes for many months, and after the Indians gave up, they went with Jackson to Pensacola and Mobile, some went to New Orleans. Austill was very sick at the Battle of New Orleans, but one of his cousins was killed there, he was a Files. About the last of Fourteen all the people were gay, money was plenty, and the people were pouring in by thousands. The County was filled with young men looking for land, school teachers getting up schools. The largest school in the territory was at St. Stephens, there I was sent with many a poor little waif to learn grammar. Our teacher was Mr. Mayhew, from North Carolina, a splendid teacher and good man. My great uncle (back several generations) was Samuel Mims. It’s a tragedy what happened there. It all was a tragedy, killin of the Settler’s and also the killing of my people the Native American’s.. Interesting to hear a first hand account of Life in Alabama back when our nation was young. I am enjoying this series….. It was a horrific massacre. 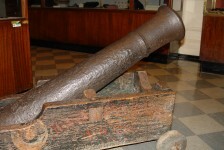 Red Eagle ( William Weatherford, whose father was Scotch) led the Indians but later turned himself in. I enjoy reading the eyewitness account of individuals that were there at the time. Thank you for these. It’s invaluable to hear first hand accounts of these events. The people of these times-all of them-were a tough group of folks!